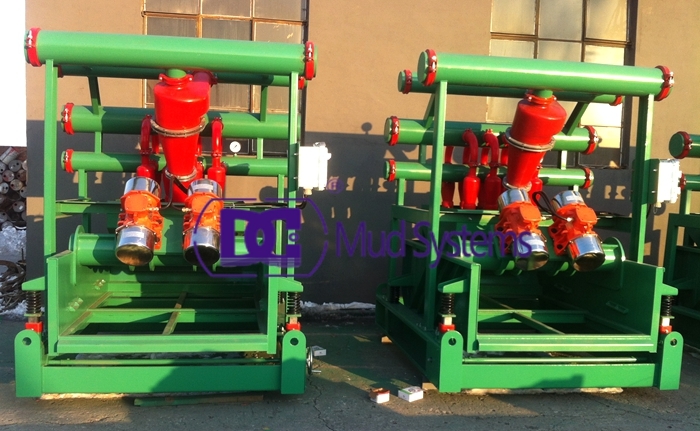 Mud cleaners is the second phase equipment of drilling fluid circulation system. 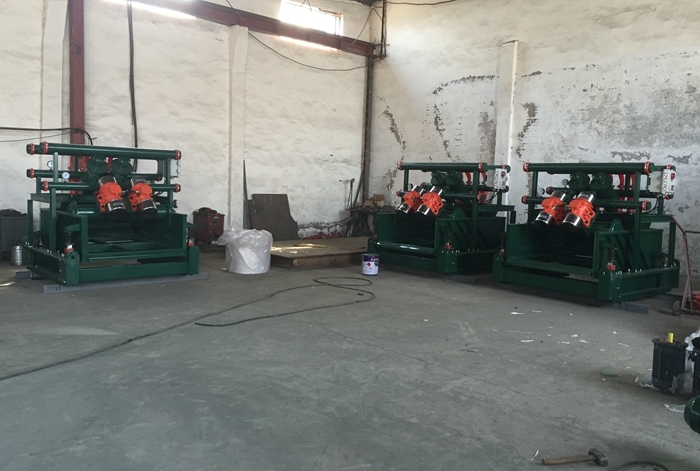 Mud cleaner is divided into many models according to actual used. But the most popular Mud cleaner is the linear motion with different Qty desander and desilter cones. 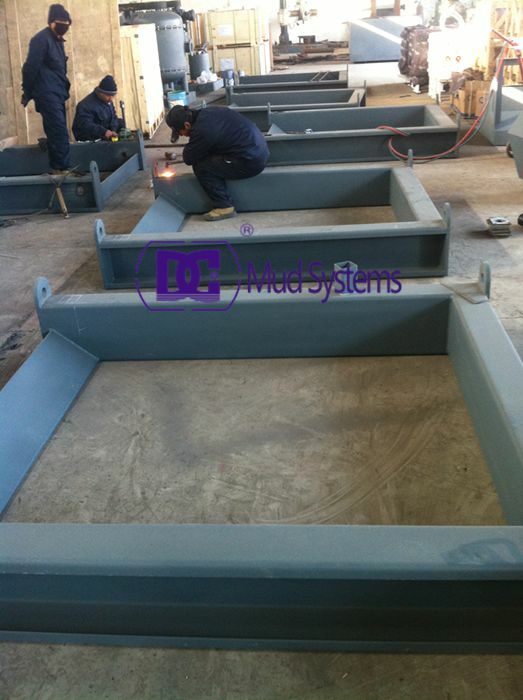 DC Solid control manufactured 3 sets Mud cleaners for Indonesia oil and gas company. DCQJ linear motion Mud cleaners absorbed advanced tech at home and abroad ,and integrated DC own design. DC complete series mud cleaners can meet customers’ variable demand. Clients feedback proved the advantages of this kind of mud cleaners: high G-force, wide screen area, compressed structure, cost-effective, etc. If you have interest or any requirements with mud cleaners, I think contact DC Solid control is your best choice. 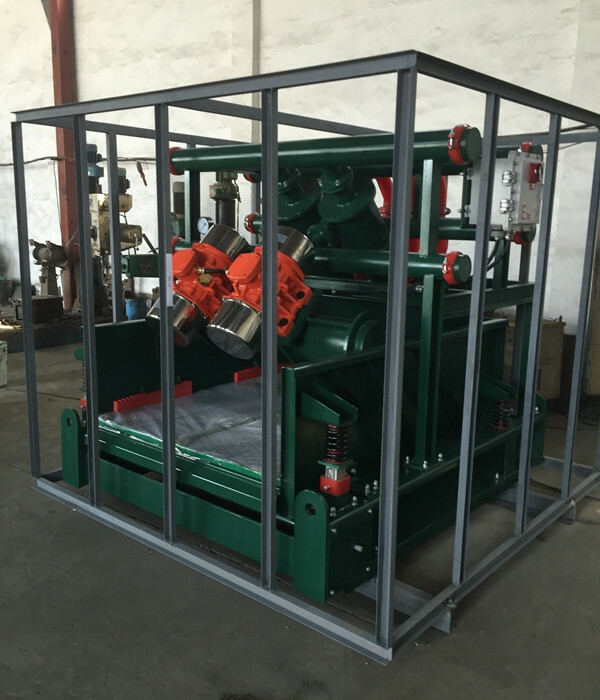 DCQJ mud cleaner is consisted of shale shaker,desander and desilter for oil&gas well drilling fluids treatment system. More importantly,mud cleaner works more effectively,especially in cleaning functions compared with separated desander and desilter.Sometimes,it can be used as a shale shaker. The mud cleaner is designed to remove the drill cuttings while allowing the weighted fillers of the mud, commonly barite, to stay suspended in the mud. The cuttings, consisting of solids greater than 74 to 105 micrometers, are filtered out in the staged process of the mud cleaner. 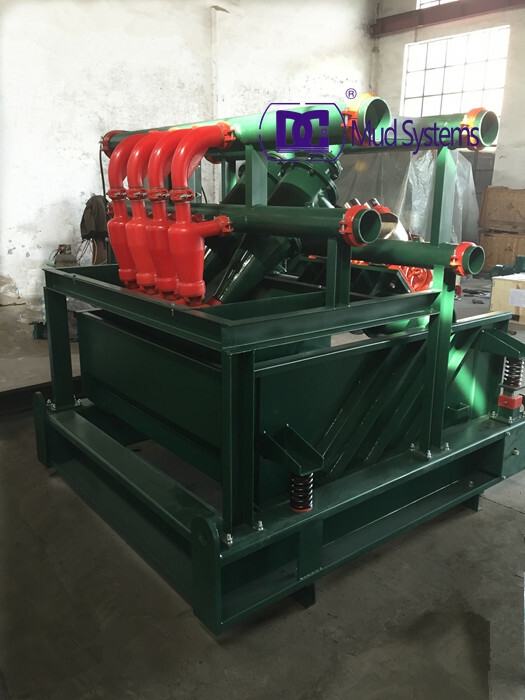 The first-pass solids control devices of the mud cleaner are the hydrocyclones which are mounted over the vibrating screen of the shale shaker. Several hydrocyclones are used to increase the flow rate of the mud. There is also a combination of varying sized hydrocyclones. Smaller cones, typically 4″ in diameter known as desilters, remove finer silt sized solids, while the larger cones typically 10″ in diameter known as desanders removed the coarser sand sized particles. 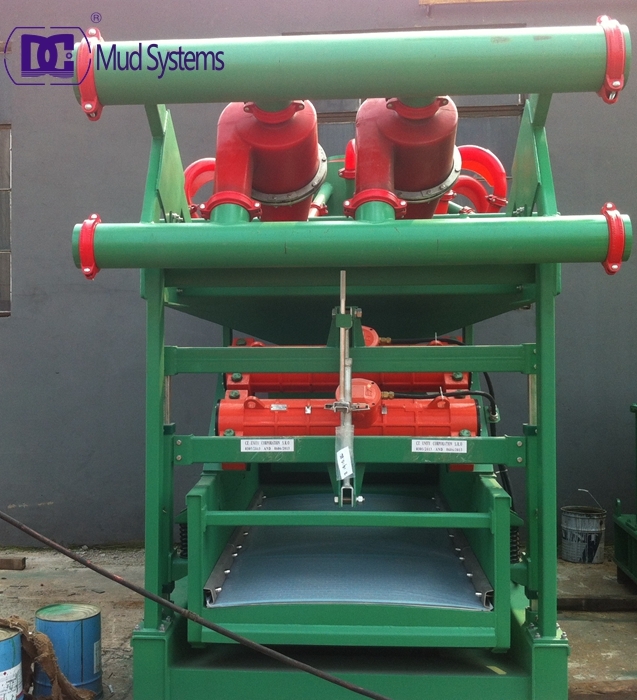 Mud cleaner is consisted of shale shaker,desander and desilter for oil&gas well drilling fluids treatment system. More importantly,mud cleaner works more effectively,especially in cleaning functions compared with separated desander and desilter.Sometimes,it can be used as a shale shaker. Mud cleaners are used to remove drill cuttings from drilling fluid, known as mud. The mud is a non-Newtonian fluid of variable viscosity that serves several purposes in drilling operations. Mud is used to drive the down-hole motor, cool the drilling bit, carry the drill cutting to the surface for disposal, and maintain hydrostatic balance in the well. According to the customers’requirements, DC SOLID CONTROL company can design the mud cleaner which can meet almost all needs. Mud cleaner combines a hydrocyclone system (desander cone and desilter cone) with a shale shaker to help remove the fine drilled solids from the drilling fluid. It consists of a two-stage separation process that using a combination of hydrocyclones mounted over a shale shaker to operate as a single unit. Desander with 10 inch cones,or 8 inch cones,or 12 inch cones act as the second phase drilling mud cleaning equipment.We have customized number cones desander for clients. Desilter with 4 inch cones,or 5 inch cones,act as the third phase mud cleaning equipment.Which clean out particles 15-45 microns. DC solids control desilter unit features the reliable polyurethane desilter cones with a unique 20o taper angle (compare to the 15o taper angle on most other unit.) The twin-cone design provides a 50% greater capacity than other 4 inche (102mm) cones. Anyhow, a customized quantity cone would be provided as per customer special request. DC mud cleaner can meet almost all needs for oil & gas well drilling fluids treatment system and HDD Mud Recycling System. 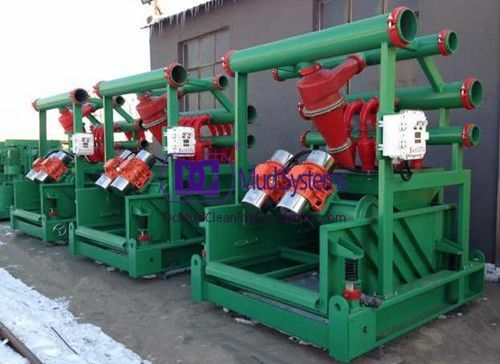 Mud cleaners are the second phase of solid control equipment in solid control system which is combination of desander, desilter and bottom shale shakers. 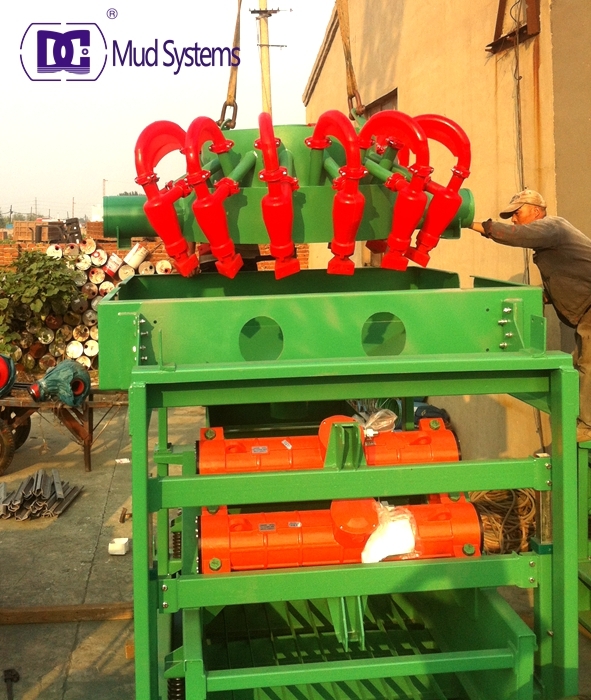 Last week, DC solid control shipped 3 sets mud cleaners to India HDD project company. Features of our mud cleaners such as our wedge-lock fastening system, mud bypass gate, and explosion proof enclosures all allow for ease of use. Our pride is truly expressed in our work through our craftsmanship, research, design, and the overall practicality of our equipment. With our in-house engineering and design capabilities, DC Solid control can integrate any number of hydrocyclone arrangements with any of our shakers. In all cases, DC Mud cleaners’s hydrocyclones come with polyurethane bodies, where erosion resistant inserts are available. Standard hydrocyclone cone sizes available include 4”, 5”, 10”, and 12” and can be provided in arrangements of one to 20 cones. DCQJ mud cleaners and are available in different configurations to meet customer requirements. 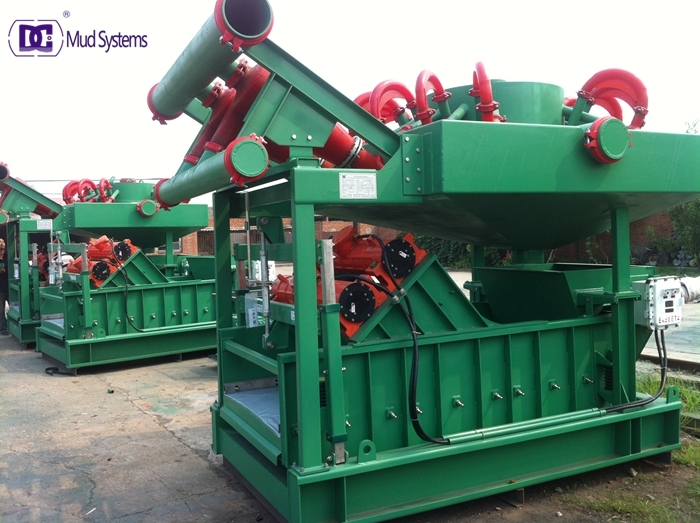 2-panel, 3-panel or 4-panel shakers are available with desanders and and/or high-volume desilters. Our new hydrocyclones technology replaces the conventional desanders and desilters cones with significant benefits. Yestersay, DC Solid control company shipped 3 set mud cleaner to the abroad clients used for oilfield. This model Mud Cleaner combines 10” desander hydrocyclone(s) with smaller 4” hydrocyclones, effectively taking two “cuts”at the unwanted solids contaminating the fluid. The 10” remove large solids down to approximately 100 microns and the 4” can remove solids down to the 20 micron size range. The vibratory screening unit is designed to take the underflow of both size sets of hydrocylones and separate the concentrated solids from the liquid. The Mud Cleaner requires two pumps to operate, with the pump feeding the 10” cyclones typically taking a suction from a compartment upstream from the compartment fromwhich the other pump takes its suction to feed the 4” hydrocyclones. The Mud Cleaner will be designed to handle the entire circulating volume of whichever system in which it is operating. Mud Cleaners are effective on both weighted and un-weighted drilling-fluid systems in removing and drying solids while retaining the expensive liquid phase. Used correctly, the Mud Cleaner can lower both drilling fluid and disposal costs. Mud cleaner is the combination of desander, desilter and bottom shaker. To be as the top quality mud cleaner in China, we have many exhibits product of best quality mud cleaner for sale at zero profit. 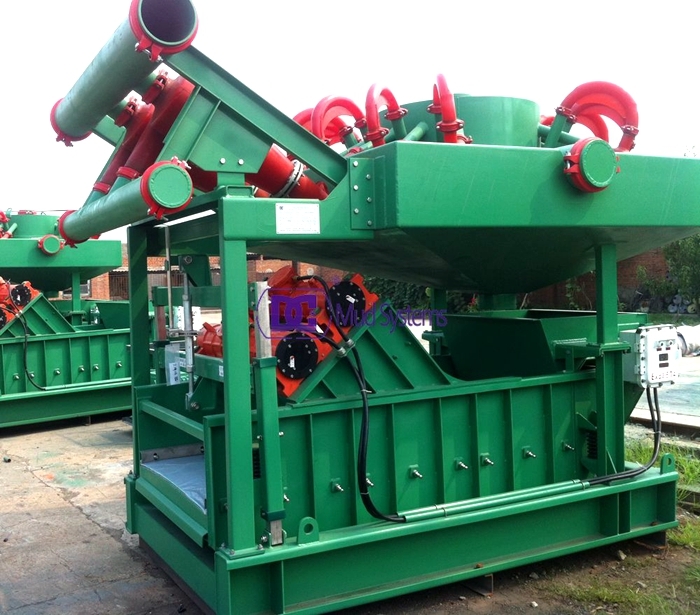 The is often installed after the shale shakers where the sand trap drilling mud feeds into the desanders and desiters respectively, the underflow of hydrocyclones loads onto the dewatering screens for recycling the usefully drilling fluids back to the mud system. The drilled cuttings above the screens are therefore dried which lowers drilling cuttings disposal cost. Avoids cost of disposing of liquid waste. Wide range Applications: OIL&GAS DRILLING—-Solids Control System; HDD & CBM Drilling —-Mud Recycling System; Mining & Industrial—-Slurry Separation Plan; Coal bed methane (CBM) & Geothermal well drilling—Fluids Cleaning System. Mud Cleaner is the second class and the third class solid control equipment and widely used in drilling fluid circulation system. DC combination of mud cleaner include desander, deserter, pressure gage, hydrocyclone, bottom flow slot, shale shaker, stents and pedestal. Have no control deceleration insitutionsm between the main into pipes and main out pipes there are spout in the pedestal, the screen located in the spout, it is easy to use and maintain, working reliable, can remove the harmful phase quickly, improve the performance of drilling fluid, meet the requirement of the new technology of high pressure spar. 1. It is a necessary equipment of deep well and super deep well disposed the aggravation of drilling fluid, it can remove the super fine solid phase in aggravation of fluid. 2. It can effectively control the content of aggravation of drilling fluid, to prevent the pressure difference the post card, adhesion the post card and other accidents,reduce the bond issues of drilling string and the thickness. 3. Save the drilling cost. 4. Improved the drilling environment. DC Mud cleaners occupys small space and the function is powerful , mud cleaner is the ideal device of the second class and the third class solid control to treat the drilling mud. 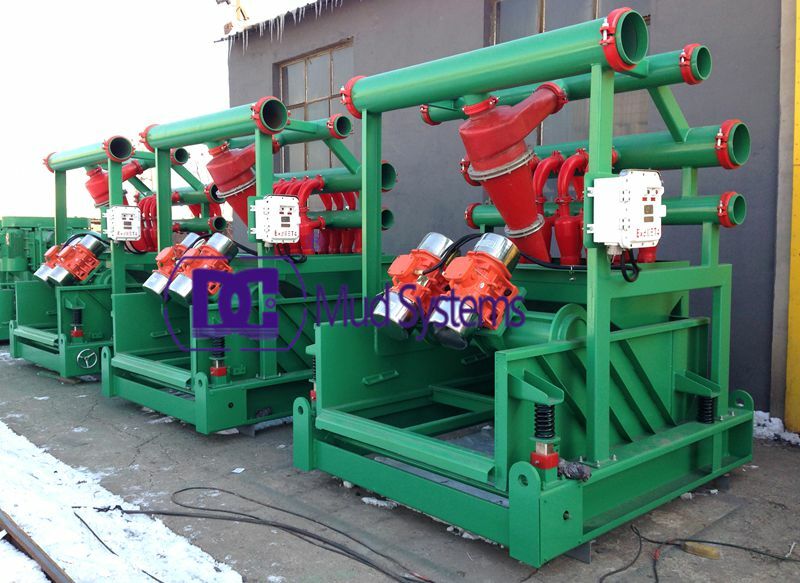 DC Solid control can design different flow mud cleaner which can equipped different Qty desander and desilter hydrocyclones on a pointed bottom shale shakers. Welcome to foreign and domestic users inquiry. 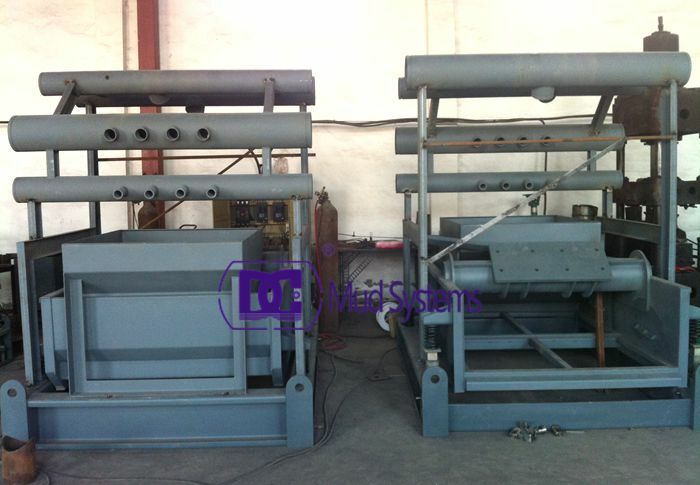 Now, the two sets of DCQJ250x2/100×8 mud cleaners are in the assemble phase. At the start of March, the Bulgria clients superadditionb ordered 2 sets mud cleaners and want to ship with the primary solid control system. 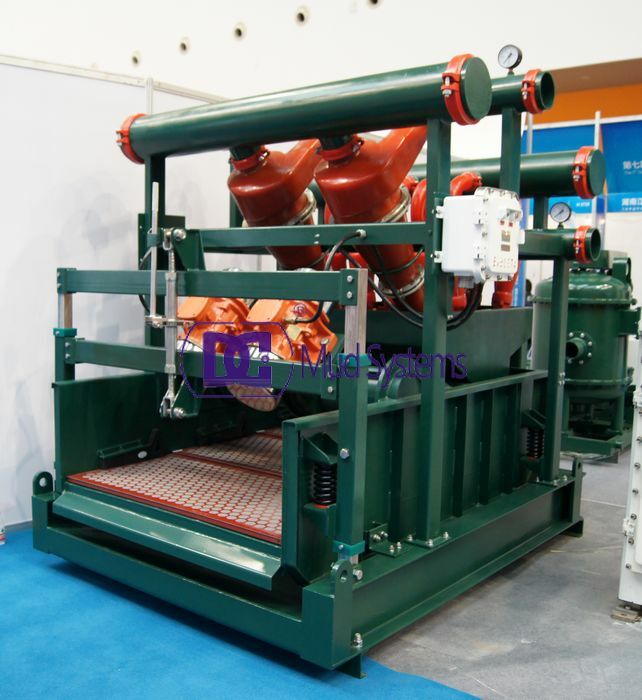 Mud cleaner is the second stage equipment of drilling fluid cleaning system mainly combine with bottom shaker, desander hydrocyclone and desilter hydrocyclones. DC Machinery used at home and abroad the most advanced mud cleaner production process, to ensure that the production of powerful, compact structure, convenient operation, easy maintenance of drilling fluid mud cleaner. 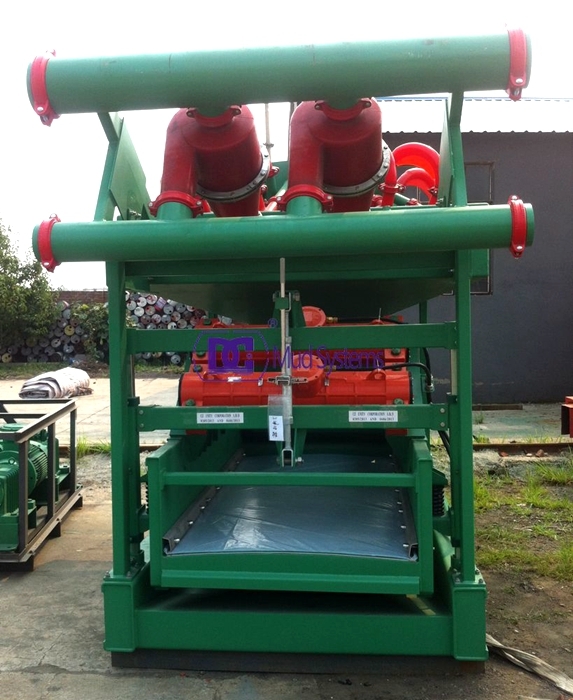 The integrated mud cleaner can integrate a group of desander and desilter on one shale shaker , the drilling fluid firstly pass the desander or desilter for separation , with overflow returning to the circulatory system and the bottom flow screened and treated by the shale shaker , if necessary , the shale shaker of the integrated cleaner could be used as the forestage shale shaker . 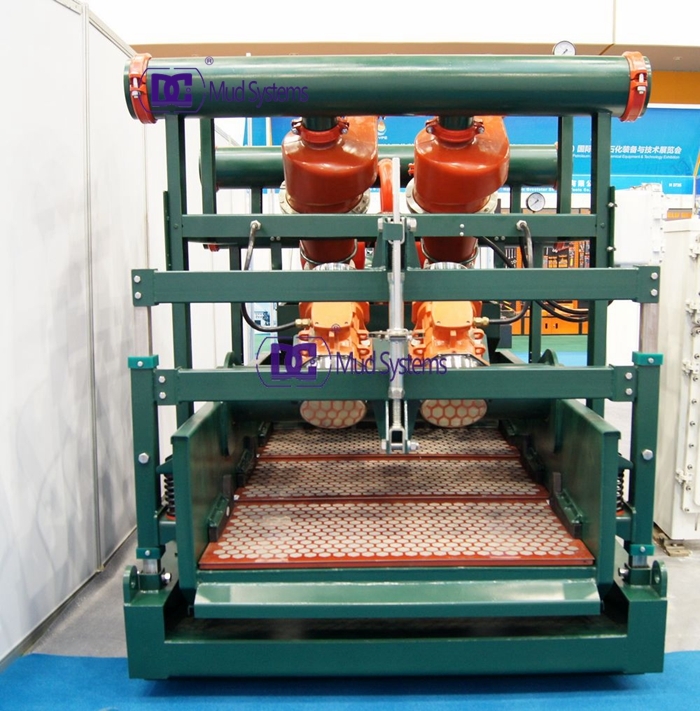 DCQJ Series mud cleaner main body structure used on the two block layout , cyclone desander , desilter arrangement on the upper base is provided with a chute , chute arranged on shale shaker , which has the advantage of compact structure , occupies small space area . You are welcome to call Dachuan Machinery to get more infos about the mud cleaner and we are appreciated to supply the cost-effective products and service for you.